You may have hear the old saying that you only have one chance to make a first impression. Your medical assistant resume is often a prospective employer’s first introduction to you and the first chance you have to make a good impression. It may be confusing to write a medical assistant resume and to know what should be included. A professional-looking resume can set you apart from other medical assisting job seekers and may help you land a higher salary, so it’s important to give a resume the attention it deserves. Before writing your resume, carefully review the job description you are applying for and make sure that your resume highlights the skills noted there. Below are the most important sections to include. Your name should stand out the most. 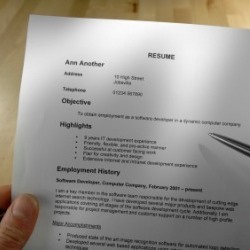 Employers will scan through resumes quickly, so you will want them to remember yours when they see it. Be sure to list achievements that highlight skills most relevant to the medical assisting role you are applying for. For example, if you worked on a special patient study or in an extremely busy practice, note it. If you received an outstanding performance review score at your last facility, note it as well. If you are a recent graduate and do not have a lot of experience, it’s important to note the experience you do have in a way that seems relevant to the medical industry. For example, if you have worked in customer service, you may have experience working with customer records which may be similar to working with patient records. If you have worked in an office setting, explain your administrative experience in a way that shows how your skills are transferable to a medical assistant position. Of course, externships are a great thing to note on a medical assisting resume, as they are both experience and education. Include anything significant as an academic achievement, such as a high GPA, being a member of a school club or organization, or any academic awards. You should also note any internships that you may have participated in through your training program. It’s also important to note your current CPR certification, and any other current certifications that may be relevant. Although it’s not mandatory, certifications in non-medical things such as computer programs can also make you more appealing to an employer. Be sure your medical assistant resume notes the computer programs you are familiar with, both medical and non-medical. If you have any specialized training in medical billing, document management systems, or speak a foreign language, it’s helpful to note that. If you do not have many skills, you can note your ability to work well with people or as part of a team, your customer service skills, or your general office skills such as ordering supplies, working multi-line phone systems and taking messages. Your medical assistant resume should be short and concise – as a rule of thumb it should be no more than one page unless you have over ten years of experience. You wouldn’t come to an interview in your pajamas, so don’t send out a resume that is only half dressed. Be sure to spell check your resume to make sure there aren’t any typos or grammatical mistakes. Your resume is the first impression a potential employer will have of you, so be sure to think of it as such.